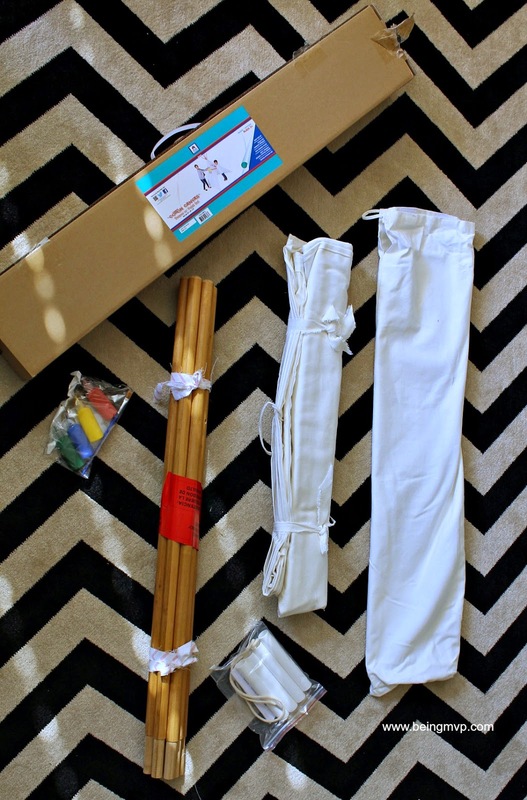 Disclosure: I received the Painting Teepee for review from Pacific Play Tents. All opinions are my own. So I've seen a flood of beautiful teepees on my Instagram feed for some time and I've been itching for Kenzie and Mason to have one. However, trying to decide on which design/fabric is daunting. 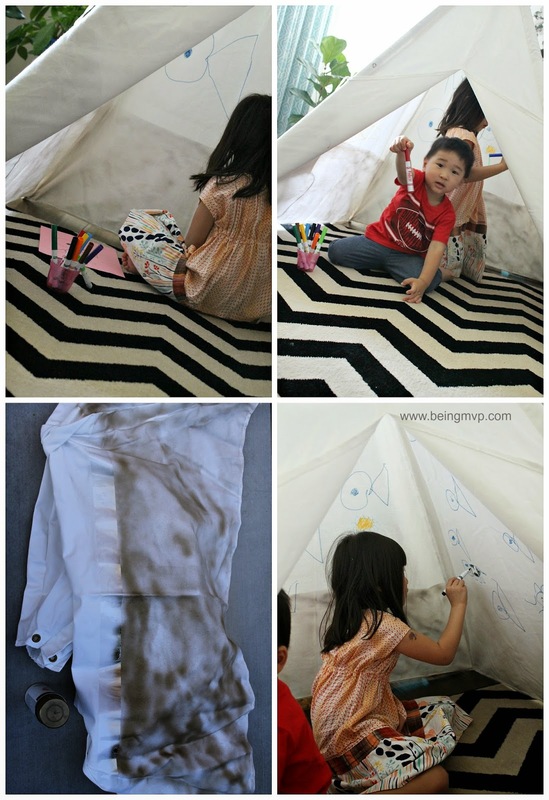 So when I saw the Painting Teepee from Pacific Play Tents, I knew it would be a fun activity for the kids as well as personalized decor for play. It was pretty easy and quick to assemble out of the box. There are sets of poles that you just connect with the plastic tube and then slide into the pre-sewn pockets along the length of the teepee. Tie with the included rope on top of the poles and it's ready for play. This teepee comes with a set of paints with a paintbrush. However, I thought it would be easier for my kids (and a bit less messier) to use fabric markers we had. I first used tape and spray paint for the outside of the teepee. I thought about doing stripes but since I was limited on time, I just did the bottom third of the tent and I think the look is unique. Since the kids would be playing inside the teepee I thought it would be neat for them to create their own art right on the inside so they can look at it while playing. They both had a blast and Kenzie, of course, claimed two panels while Mason was only allowed to draw on one. 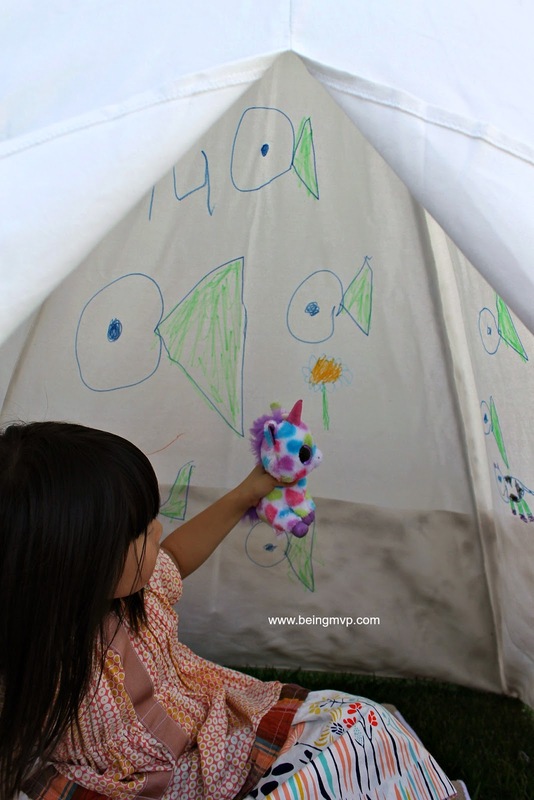 The painting teepee for kids is generously sized at 64" tall with the four sides measuring 45" each. The kids definitely have a blast playing in it both indoors and out. If you want, you can even make this easy pom pom decor for the top of your teepee poles! Just open the flaps to allow guests in or tie up to have a camping party inside. It's all up to your child's imagination to decorate and play. 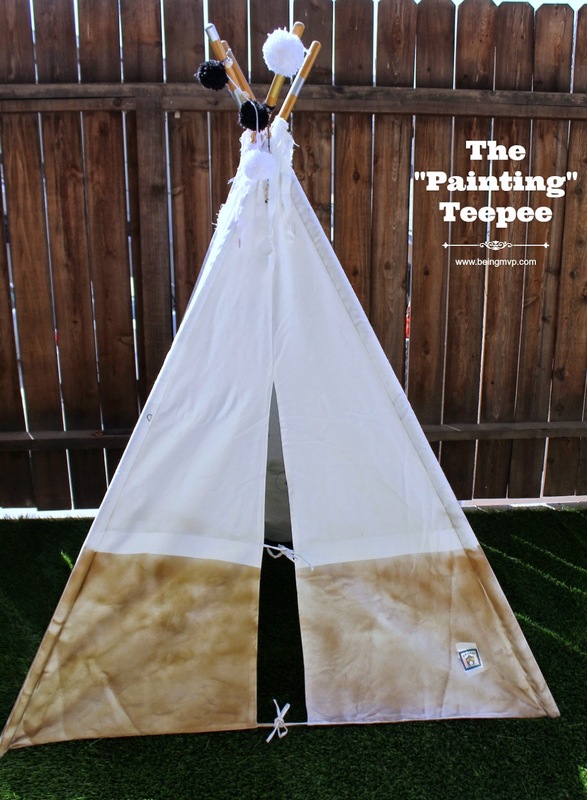 Do you think your child would love this painting teepee? I would get the pirate ship for my son. I'd like the Come Fly With Me tent for my friend's daughter. I would like to get this for our family: Item: 86-941, 30 Foot Institutional Parachutes without Handles with Carry Bag that costs $66.50. I would like to have their Under The Sea Beach Cabana. It would be for my son and daughter! I like the cottage bed tent and the my little tent. Kings Kingdom Combo for my kids. I would get a Beach Cabana tent for my kids at the beach this summer! Kings Kingdom Combo for my son! I love the cottage bed tent and it would be for my friend's child for her birthday. I would have to get the my 1st garage playhouse for my little nephew, he would love this. Not sure if my other comment went through, but I'd love to have the One Touch Cabana 60 Inch X 35 Inch X 40 Inch! I'd use it for both my daughters and it would get a lot of use in the yard, at the park, in the playroom, etc. The cottage bed tent would be super fun for my daughter to have on her bed. I would love the Secret Castle Bed Tent for my daughter! I would love to get the Cottage Bed Tent - 77 Inch X 38 Inch X 35 Inch for my daughter. I'd like to get the ocean adventures dome tent for my son. 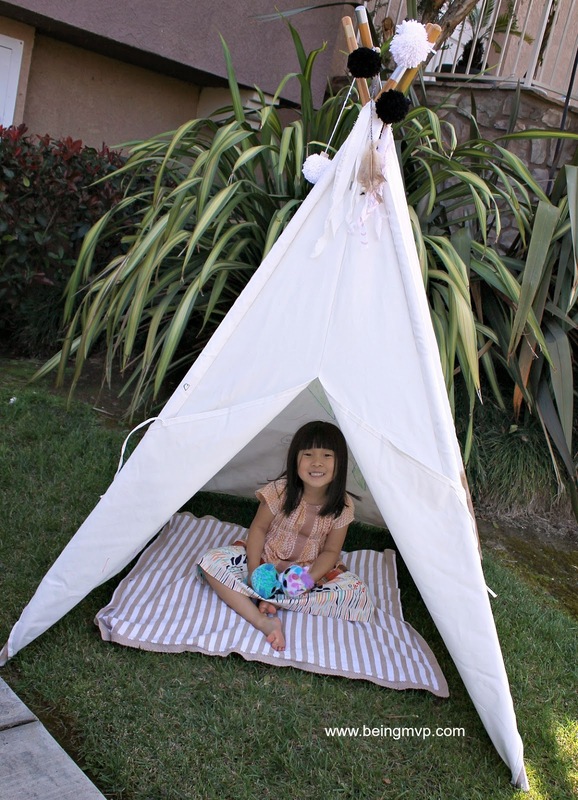 OMGoodness... this little teepee is so perfect! My little man is also crazy for the Red Farm House Teepee too! I like the secret castle bed tent for my daughter. I would love to get the Cottage Bed Tent for my daughter. I'd get the Under the Sea Beach Cabana, for my son! I like the southwest cotton tee-pee. I would get a bed tent for my son. Oops forgot to add that it would be for dd! I'd get the My Little Tent for my nephew. Cottage Bed Tent for my grandson Zxylan and his brother Zavier! My son owuldl love the pirate ship! I love the 10 foot Playchute Parachute. It would be really fun with all my nieces and nephews and my little ones someday! I would get a 12 foot parachute for my kids. I'd get this tent for my kids...luv it! I would get the ocean adventures dome tent for my niece and nephew!! I would probably buy the Super Duper 4 Kid Play Tent for my granddaughter, Nellie and her friends. I'd like the Come Fly With Me tent for my granddaughter. I think either the Club House or Jungle Safari Tent & Tunnel Combo. I would get the "Teacher" Chair - Grape for my daughter. Purple is her fav color. I would get the One Touch Cabana 60 Inch X 35 Inch X 40 Inch for myself. my kids would LOVE the dragon lair tent! im sure it would be hours of imaginary play! I would get the cottage bed tent for my granddaughter. I'd like to get the Seaside Beach Mat for my daughter. Thank you!